Innovation in health care is hard. Innovation in primary care is difficult. Innovation in healthcare is impossible. We have heard it all. We have seen it in real life. Despite significant investments in allowing for innovation in healthcare, nearly half of new healthcare innovations fail initially 1 . More specifically, in health technology and telehealth (see definition below), there is often a disconnect between solid and robust technology and its success in primary care clinical environments 2 . In a literature review analyzing challenges in telehealth adoption, researchers found 7 key challenges, including: staff training, skepticism, and fears; lack of dedicated project management; patient engagement and support; technology and software problems; partnerships and integration with the larger health system; funding and reimbursement; and long-term strategic planning 3 . Telehealth innovation in primary care (often used interchangeably with telemedicine), is defined as a means of using digital telecommunication technologies to enhance health care, care delivery, public health systems, and health education4. The wide adoption of health technology has demonstrated a significant beneficial impact on improving access to care, the quality of care, and more efficient health care delivery, while also potentially reducing costs 4 . Therefore, the potential for health technology innovations to achieve the Quadruple Aim – improving population health, patient experience, and clinician/care team experience while reducing costs - is substantial. While more research is needed on how health technology, as well as each of the four broad categories of telehealth (live video telehealth, store-and-forward technology, remote patient monitoring, and mobile health solutions) contribute to the Quadruple Aim, much has been demonstrated already 5 . In many health care institutions, various technology modalities are used at once, and over 60% of all health care institutions in the United States are leveraging telehealth in some form 6 . At the same time, patients, as consumers of health care, are increasingly expecting to interact with technology in healthcare as seamlessly as they do with other industries 5 . Essentially, we must get health technology right. We have to. Despite the imperative, this healthcare is often delivered in environments with complex systems and processes of care, as well as competing priorities. Nearly 50% of technology solutions in primary care settings are unsuccessful initially, many health care clinicians, leaders and staff are ill-prepared for taking charge of telehealth adoption, and a new era of digital health care requires a new set of approaches. How then do those responsible for health technology implementation get it right? 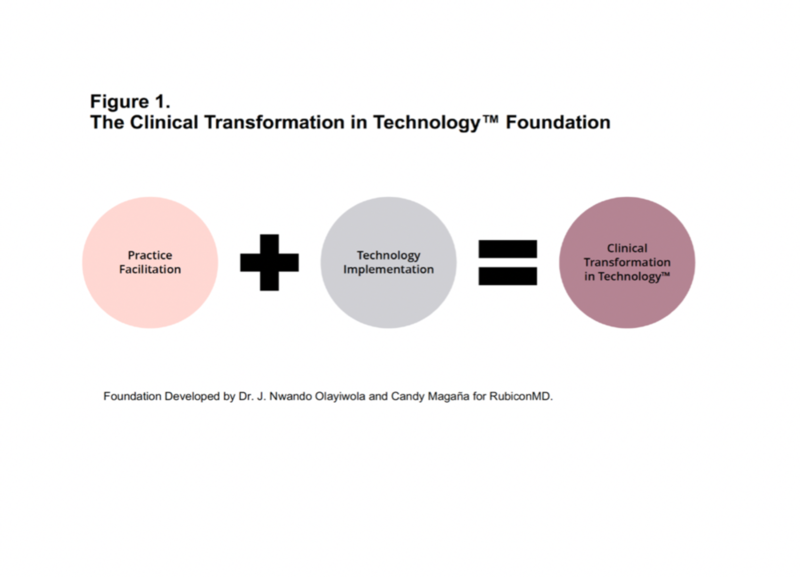 It is precisely in this context that we have developed the Clinical Transformation in Technology (CTT)™ approach to leading the adoption, implementation and expansion of health technology/telehealth innovations in clinical settings. 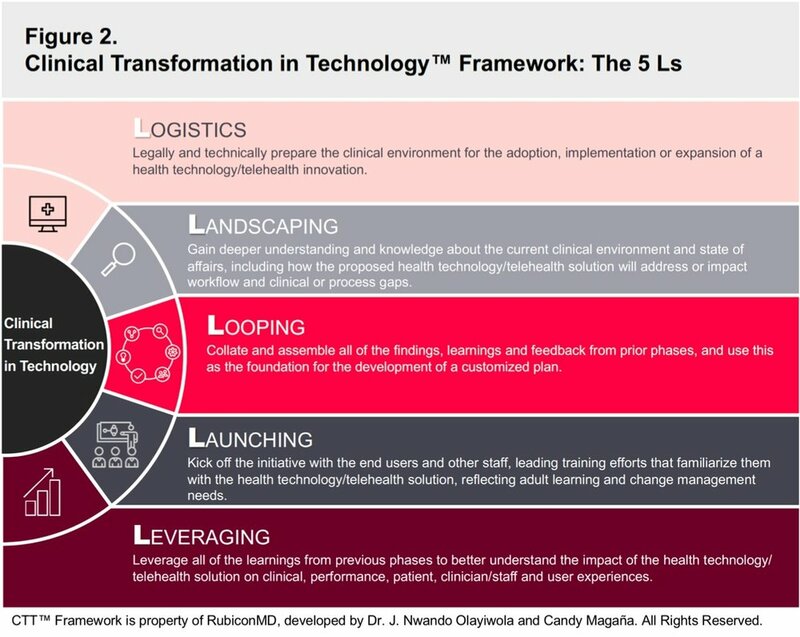 The Clinical Transformation in Technology™ framework is based on harvesting and collating learnings from successful health technology/telehealth implementations, including our findings from a range of successful electronic consultation programs we have launched in diverse clinical settings with RubiconMD 7,8,9,10 . These learnings coupled our decades of experience with the art of practice facilitation in primary care settings, which has tremendous yield in driving behavior change, improving quality of care, gaining patient and care team buy-in, and building capacity, form the foundation for CTT 11,12 (Figure 1). The CTT framework is comprised of 5 major phases, or the 5 Ls (Table 1). • How does this technology initiative align with the larger organizational goals and strategy? • What sort of technical infrastructure is necessary to support this telehealth solution? • Are there existing policies or privacy rules that will need to be modified for health technology/telehealth? • Which voices need be included in the project and who will drive the process? • How will contracting occur and will the initiative require separate contracts, business associate agreements, consent forms, etc.? • How will the proposed technology solution address challenges in clinical or process performance? • What care delivery structures currently exist that could support the new technology? • What does the current workflow look like? How will the new technology improve the workflow or how will the workflow enhance the new technology? • What are the concerns of the members of the care team who will engage with the technology? • What are solid SMART goals that are unique to this telehealth initiative? Looping (Feedback): In the Looping phase, the goals are to collate and assemble all of the findings, learnings, and feedback from prior phases, and use this as the foundation to form a customized plan. This involves collaboration with relevant stakeholders to prepare an organizationally-authentic adoption, implementation, and/or expansion plan that reflects the needs and realities of the organization. During the looping phase, initial project charters, SMART goals, and workflows may need to be adapted, and policies or procedures that are missing should be developed. This is also the opportunity for the program to be discussed and socialized with the staff and end users, preparing them for the upcoming and exciting change while starting to field questions and concerns that may arise. • What sort of change management techniques should be employed with this organization/team? • What did we learn in earlier phases that can inform future planning and communication? • Are the initial SMART goals and workflows still applicable? If not, how should they be revised? • How will the training of the end users be adapted based on the results of surveys, assessments and other communications? Can we build a user-responsive training plan? • Who are the right stakeholders to move forward? Are there identified champions or super users to be groomed? Launching (and Leading): In the Launching and Leading phase, the goals are to kick off the initiative with the end users and other staff as well as lead training efforts that familiarize them with the health technology/telehealth solution. During the launching and leading phase, it is essential that the training experience is reflective of adult learning needs, aligns with the goals of the organization and initiative, and acknowledges the sentiments expressed in earlier phases by the various stakeholders. Leading through the launching phase requires purposeful and focused training, and as much technical or other support as is needed for success with the launch. • How can the training be tailored so that it meets the needs of diverse adult learners with various levels of comfort with technology? • What sort of events and communication should occur between the training and the actual go-live date, and between the go-live date and the launch? How can momentum be sustained? • How can the training allow for actual case-based learning that will make the technology immediately applicable? • In what ways can the champions and technology super-users be leveraged for the initiative? • What additional support may the organizational participants and end users need after the launch of the telehealth initiative to drive adoption and usage? Leveraging (Learnings): In the Leveraging phase, the goals are to leverage all of the learnings from previous phases to better understand the impact of the health technology/telehealth solution on patient care, clinician and user experiences, workflows and both clinical/performance, and operational metrics. These findings should directly relate to the technology-focused SMART goals initially set and revised in the various phases and should be supported by findings from Plan-Do-Study-Act (PDSA) cycles, or small tests of change in real world settings. This involves active listening, engagement and revision of processes as needed in real time 14. Additionally, in this phase, learnings can be leveraged to drive plans for expansion and spread, replication, and the layering of other telehealth initiatives onto the current program. • What is the best strategy to track the performance and operational outcomes of the health technology/telehealth solution with transparency and visibility for all stakeholders and users? Who will make necessary changes once this occurs? • How can reinforcement or support be provided for those with less comfort using the new technology, those resistant to the new technology, or those who find it challenging to integrate into their workflows? • What sort of celebratory milestones can be created to acknowledge small wins and team accomplishments? • What has been learned that can be useful as the telehealth initiative expands? Advances in health technology and telehealth have accelerated the need for robust implementation models, such as the Clinical Transformation in Technology™ framework, in primary care and other clinical practice settings. Many of the challenges with implementation of high value technologies in clinical practices are the result of unstructured approaches, limited human resource capacity, or insufficient training in the applications of technology in complex clinical environments. By applying a CTT framework and coupling core strategies from technology implementation and practice facilitation, we offer a fresh change management approach for primary care clinical settings, empowering them with the opportunity to get telehealth and health technology right. Dr. Nwando Olayiwola is a Board-certified practicing family physician, experienced leader in practice transformation, and the inaugural Chief Clinical Transformation Officer for RubiconMD, a leading health technology company providing electronic consultations between primary and specialty care clinicians. She is also an Associate Physician and Clinical Instructor at University of California, San Francisco (UCSF) and an Instructor in the Center for Family and Community Medicine at Columbia University. She serves on the Boards of numerous primary care and health system improving organizations, including Primary Care Progress and Qualis/Health Insight. She is the former Director of the UCSF Center for Excellence in Primary Care. Dr. Olayiwola is the creator of the Clinical Transformation in Technology™ framework and co-creator of the Clinical Transformation Specialist Education program© at RubiconMD. Ms. Candy Magaña is an expert public health and primary care practice transformation leader. She currently serves as the Manager of Clinical Transformation at RubiconMD, where she co-created the Clinical Transformation Specialist Education program©. Prior to this, she was the Manager of Practice Coaching and Training at the UCSF Center for Excellence in Primary Care, where she was the primary trainer and most senior practice coach, gaining experience improving primary care delivery in diverse clinical settings. She has also held roles as a Program Manager at the San Francisco Health Plan and Quality Improvement Manager at the New York State Primary Care Association. Herzlinger, Regina E. "Why innovation in health care is so hard." Harvard business review 84, no. 5 (2006): 58. Olayiwola, J. Nwando, Ashley Rubin, Theo Slomoff, Tem Woldeyesus, and Rachel Willard-Grace. "Strategies for primary care stakeholders to improve electronic health records (EHRs)." The Journal of the American Board of Family Medicine 29, no. 1 (2016): 126-134. Joseph, Victor, Robert M. West, Darren Shickle, Justin Keen, and Susan Clamp. "Key challenges in the development and implementation of telehealth projects." Journal of telemedicine and telecare 17, no. 2 (2011): 71-77. Kvedar, J., Coye, M.J. and Everett, W., 2014. Connected health: a review of technologies and strategies to improve patient care with telemedicine and telehealth. Health Affairs, 33(2), pp.194-199. Tuckson, Reed V., Margo Edmunds, and Michael L. Hodgkins. "Telehealth." New England Journal of Medicine 377, no. 16 (2017): 1585-1592. Liddy, Clare, Julie Maranger, Amir Afkham, and Erin Keely. "Ten steps to establishing an e-consultation service to improve access to specialist care." TELEMEDICINE and e-HEALTH 19, no. 12 (2013): 982-990. Tuot, Delphine S., Elizabeth J. Murphy, Charles E. McCulloch, Kiren Leeds, Evelyn Chan, and Alice Hm Chen. "Leveraging an electronic referral system to build a medical neighborhood." In Healthcare, vol. 3, no. 4, pp. 202-208. Elsevier, 2015. Moehr, Jochen R., J. Schaafsma, C. Anglin, Stefan V. Pantazi, Nicole A. Grimm, and S. Anglin. "Success factors for telehealth—a case study." International Journal of Medical Informatics 75, no. 10-11 (2006): 755-763. Mao, Alice Yuqing, Connie Chen, Candy Magana, Karla Caballero Barajas, and J. Nwando Olayiwola. "A mobile phone-based health coaching intervention for weight loss and blood pressure reduction in a national payer population: a retrospective study." JMIR mHealth and uHealth 5, no. 6 (2017). Baskerville, N. Bruce, Clare Liddy, and William Hogg. "Systematic review and meta-analysis of practice facilitation within primary care settings." The Annals of Family Medicine10, no. 1 (2012): 63-74. Knox, Lyndee, Erin Fries Taylor, Kristin Geonnotti, Rachel Machta, Jung Kim, Jessica Nysenbaum, and Michael Parchman. Developing and Running a Primary Care Practice Facilitation Program A HowTo Guide. No. cf15b9115d714275b538a9c835145652. Mathematica Policy Research, 2011. Minnesota Department of Health Public Health and QI Toolbox. SMART Goals. http://www.health.state.mn.us/divs/opi/qi/toolbox/objectives.html. Accessed December 13, 2018. Institute for Healthcare Improvement. Science of Improvement: Testing Changes. http://www.ihi.org/resources/Pages/HowtoImprove/ScienceofImprovementTestingChanges.aspx. Accessed December 14, 2018.